Version 3.0.3 of Color Hints was released today. This is a bug fix release. Swatch collections for DMC thread (and JP Coats equivalents) and Dimensions (and DMC equivalents) thread were added today. These collections can be downloaded to your copy of Color Hints. The Timeless Treasures collections were updated today. Click here to see all of the Timeless Treasure collections available to download. The Timeless Treasures collections were updated today. Color Hints 2.4.2 is now available in the App Store. This version provides better compatibility with iOS 9, including split screen and slide over on iPads. The Timeless Treasures downloadable resources were updated to match the current Timeless Treasures web site. Color Hints 2.4.1 is now available in the App Store. This version corrects an issue, that under some circumstances, caused the match counts in the search results to be incorrect. Color Hints 2.3 is now available in the iTunes Store. 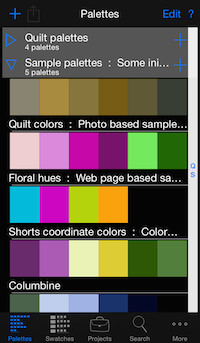 Color Hints is no longer unresponsive when importing palettes, swatches and projects. Also shows a busy indicator while importing. FAQ added: When I sort my search results, sometimes the table shows items with 3 matches before items with 4 or 5 matches. Why does this happen? Color Hints now has a Facebook page. Palettes and Swatches can now be posted to twitter, facebook and other social media.